A short consideration of three stone design factors to consider when deciding on redesigning or renovating your kitchen. Granite pricing seams to be all over the map. With prices varying so widely, how can you tell if you are getting a good deal? This article considers some factors. In this article we will take a brief look at how some of the colors mentioned in that article are being used in kitchens. 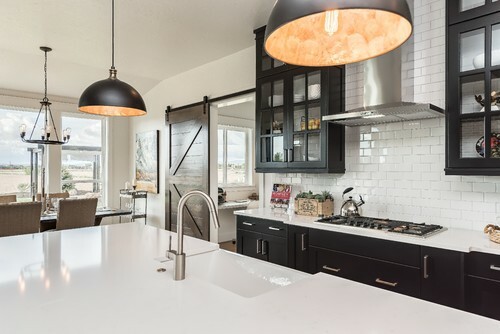 As one of the popular design styles for kitchens right now, the modern farmhouse style is one that you have no doubt heard about. Its fresh, country living feel draws us in and speaks to the heart. The appearance of modern farmhouse kitchens can be achieved by combining a collection of specific elements to create a harmonious theme. Thus, knowing which ingredients are needed to construct a kitchen with this design style is of interest. It acts as a palette from which to create your work of art. In this article, we will briefly look at the elements that go into a modern farmhouse style as it applies to kitchens. Then, you will be able to put together the modern farmhouse kitchen that warms the heart of your guests. One of the main features of a kitchen is the cabinetry. As one of the features that have the most surface area, this aspect of the design plays a key role. So which kinds of cabinetry are great for creating a modern farmhouse kitchen? If you said hard wood, you would be correct. This material is perhaps the best fit for the design. Why? Well, the design style calls for something traditional. Hard wood accomplishes this. Additionally, hard wood is also not too modern looking like other materials can be. Although the cabinetry need not be white, a great deal of the cabinets in a modern farmhouse kitchen are. However, they can in fact be any color. The key is to use a good combination of surfaces, hardware and accessories when composing your design. The blend of traditional details with the modern feel is what produces the desired experience. The best color schemes for the modern farmhouse kitchen are neutral. So, black, white, beige, and gray shades are excellent choices around which to to build the design. However, this is a general rule or guideline rather than a hard and fast rule. 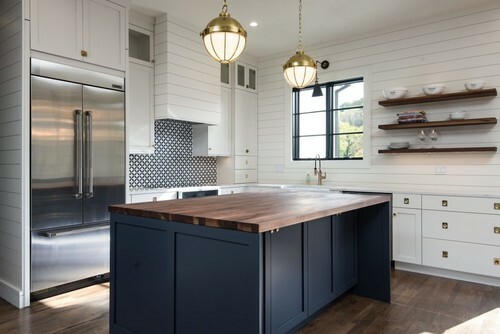 For example, navy blue is used for some modern farmhouse designs. The idea of the hardware, as mentioned before, is to create somewhat of a contrast with the rest of your color scheme. There are a number of ways to do this, so select which colors work the best for your kitchen design. What about the styles of lighting that work well with our modern farmhouse design? In actuality, lantern style lighting is a great match! The key is to get plenty of light and at the same time, adorn the space with fixtures that contribute to the "farmhouse" look. Lantern pendant lighting accomplishes this blend of style and performance. And, since the lighting is considered hardware, you will want it to be of the same style as the rest of your kitchen hardware. Storage is an important aspect of kitchen design. Having enough storage and the functionality of the storage you have are both aspects that people think of when they consider kitchen design. One of the elements that contributes to an appealing modern farmhouse kitchen is storage that is open; particularly on the walls. Having open shelving on the walls rather than closed cabinetry creates an open, spacious feeling that is a characteristic of farmhouses. It also allows you to display various other items that contribute to the feel for which you are striving. Items like cookie jars, dinnerware, and even serveware that are heirlooms are good candidates for having a place on your open shelving space. Keep in mind that the idea to create a particular look and feel and if the material you select accomplishes this, then why not give it a shot? Also, some materials offer various finishes on their surface. For example, some stone surfaces allow for an antiqued finish. Keeping the finish type in mind can also help you select the perfect counter top for your modern farmhouse kitchen. What about choosing the appropriate backsplash? When it comes to kitchen design, the perfect backsplash is a key element for projecting a particular look and feel. However, the functionality is important as well. And it is no different in a modern farmhouse style. So, which backsplashes fit the best with the farmhouse design? Any of those materials above will suffice for a modern formahouse kitchen backsplash material. You will want to sleect a material that compliments the rest of your design. If you already have a significant amount of wood, then maybe a wooden backsplash is a bit too much. Many farmhouse kitchens use a white subway tile for the backsplash. Up to now, we have taken a look at everything but the proverbial 'kitchen sink'. So what kind of sink is the best fit for a farmhouse kitchen? While there is more than one you could choose to use, the most common is an Apron Sink. 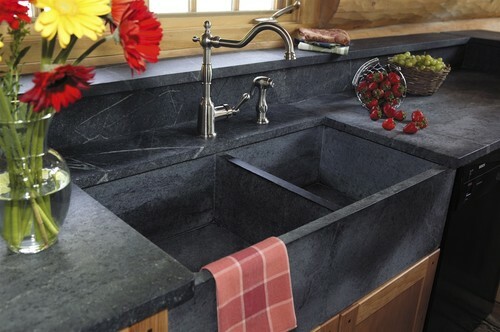 In fact 'Apron Sinks' are synonymous with 'Farmhouse Sinks'. The large basin and exposed front are hallmarks of this sink style that fit perfectly within the farmhouse atmosphere. What should you consider when choosing your next countertop color? Is there any benefit to selecting from colors that are popular or good sellers? What are some colors that are popular? In recent years, more and more people are selecting quartz as the material of choice for use in their kitchens. Why is that the case? Learning why might help you determine if quartz is right for you. Are you trying to decide whether you should refinish your existing counters or replace them? This article discusses some things to keep in mind. Getting a rustic kitchen design is not particularly challenging when you are aware of the design techniques that make a kitchen look "rustic". Upgrading your kitchen does not have to require a full remodel or renovation project. These simple, "smaller" projects can upgrade you kitchen, and most of them you can do yourself. If you are looking for a kitchen sink to add to your chosen stone countertop or you are trying to select just the right sink for your new home construction, this article discusses kitchen sink options.